-- Gambino's is based out of New Orleans and they bring their traditional NOLA style king cakes to Lafayette daily during the Mardi Gras season. They're not baked in-house. Since they're baked off site and shipped to Lafayette, there is a certain freshness quotient that is lost here. And, what is up with strawberry filling costing more than raspberry or pineapple filling? This is America in a "post-frutism" world! Aren't all fillings (fruit at least) created equal? All that aside . . . . . . . 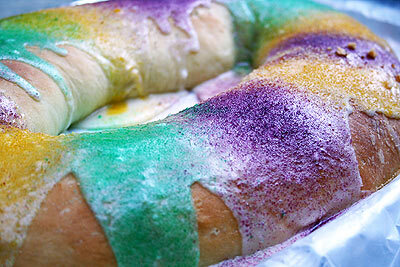 According to Gambino's, "king cakes are festive dessert confections coated with icing and purple, green and gold sugar. The bakery’s unique take on this seasonal desert has made it the only king cake option for many locals, and now turns out thousands of king cakes every year ... year-round. Clients such as David Letterman and Oprah Winfrey have enjoyed Gambino’s King Cakes and sent them to friends!" 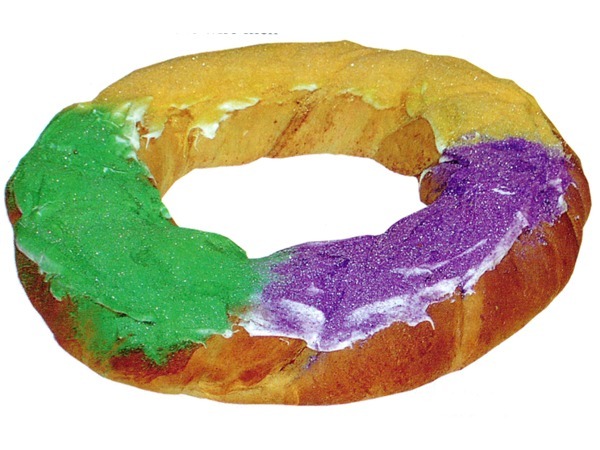 So, if you strive to be like David Letterman or Oprah Winfrey this might be just the king cake for you. If you're used to a Cajun Country type of king cake, you may find Gambino's drier and with less filling. It is, however, super dense and coated with a "beautiful and colorful iced topping." Ordering - Walk in and they usually have an ample supply of king cakes for the purchasing. However, if you want a particular flavor we suggest you order a few days in advance.